I saw this vase yesterday and was astounded byt the quality and weight. 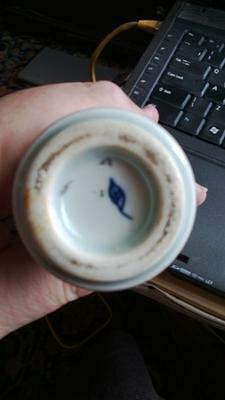 I have had a look at 'leaf' marks and the only one I can find is the Kangxi period mark. 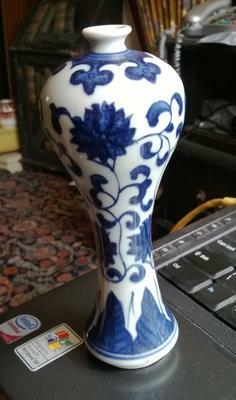 The vase is 14cm talland has a very small opening at the top - approx 3mm. Has anyone any ideas please? Comments for Any Ideas Please? and you'll see where the potter has drawn his inspiration from. This is a contemporary piece inspired by a traditional shape. Hi, marks can be copied. This one is located off-center, which is rarely the case with traditional Chinese porcelain. The unconventional banana leaf decoration, shape and foot rim all point to a modern production date.